This BBC page has this bit which would suggest, from events on the ground that the new man at the helm, a former ADC to the ousted Blaise Campaore is not welcome to hold the top political seat in the country. The demonstrators see military chief Honore Traore as a part of the rot and corruption so would want him to step down in favour of another General who fell out with Blaise Campaore because he dared question him over the armoury of his Presidential Guard. General Kouame Lougue whose name was being raised to the roofs by the demonstrators was court-martialled on the orders of Blaise Campaore when he told him to his face that it was not proper for the Presidential Guard to have the best and modern weapons of choice while the army had to do with equipment that was not up to scratch. "Burkina Faso's President Blaise Compaore has announced his resignation, following violent protests at his attempt to extend his 27-year rule. 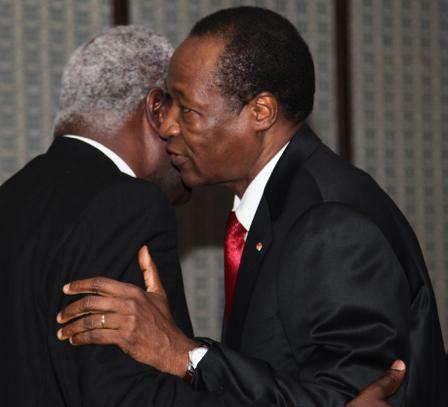 Mr Compaore issued a statement saying the presidency was now vacant and urging elections within 90 days. Military chief Gen Honore Traore said he had taken over as head of state "in line with constitutional measures". Crowds danced and cheered in the capital, Ouagadougou, after Mr Compaore's resignation was broadcast. On Thursday, protesters angry at his attempt to amend the constitution had set fire to parliament and government buildings. There was a euphoric atmosphere in the Place de la Nation as the thousands of protesters heard that Blaise Compaore was no longer their president. The demonstrators sang the national anthem. But the crowds have no intention of going home, as they are unhappy that Gen Honore Traore has been appointed as transitional head. He is seen as too close to the ousted president - he was Blaise Compaore's aide de camp - and for these demonstrators that is not enough of a rupture with the past. They have been chanting "Lougue, Lougue, Lougue" - the name of retired Gen Kouame Lougue, a former defence minister who fell out with Mr Compaore in 2003. "This is not a coup - this is a popular uprising," one man in the crowd said. "We rose up, we fought and we won, and now we are saying we want this man to lead. We don't want Honore, we want Kouame Lougue." The rat and his kitchen cabinet at State House must be getting mighty jittery at the turn of events in Burkina Faso. This was the country to be first visited by him after he won the 2007 elections and up to now satisfactory answers have not been supplied by him or his hired shameless praise singers as to why Burkina Faso and Blaise Campaore should be their first port of call. Many theories had emerged - that he could have gone there to say thanks to Blaise Campaore for his support after he threatened that he would not accept the 2007 election results if he lost. What deal had he worked out with Blaise Campaore? Could the great game changer/seller, the one and only Christiana Thorpe got some mighty pressure put on her? There were even reports that fugitives wanted by the Special Court and other rapists and murderers of the AFRC/RUF coalition of evil aka the beasts are still in hiding and protected by Blaise Campaore. We would again want to remind you of what we had stated all along - that Blaise Campaore's regular troops were with the RUF when the beasts entered our country from Liberia. We would again like to remind our readers that when these Burkinabe regular soldiers were killed, our troops got their ID tags off as evidence that was presented to one ECOWAS summit by NPRC leader one Captain Valentine Strasser. He was prevailed upon not to make too loud a noise about it after assurances that these troops would be removed from Sierra Leone territory. Sierra Leoneans who survived the invasion and subjected to wanton acts of violence could recall these black-uniformed non-English-speaking armed men whose accents were neither Liberian, nor Sierra Leonean and could not speak English that well. 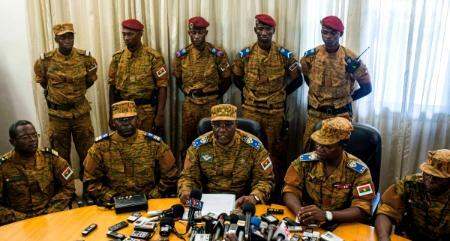 These were the troops sent by Blaise Campaore and they were from the Burkinabe national army. Now is the time for the international community to try Blaise Campaore so that the final chapter in the true story of the rebel carnage in our region could be written. This report by the Guardian gives an idea of the scale of violence as the people rose up against a dictator. "Burkina Faso’s president, Blaise Compaoré, one of Africa’s longest-serving leaders, has been swept from power after 27 years by a violent popular uprising. Compaoré announced his resignation on Friday as hundreds of thousands of people took to the streets in protest at plans to extend his rule. General Honoré Traoré, head of the armed forces, said he had taken charge of the west African country. Like so many strongmen before him, Compaoré was forced to abandon the luxurious trappings of the presidential palace and flee for safety as his regime collapsed. A heavily armed convoy believed to be carrying the 63-year-old was seen travelling on Friday towards the southern town of Po, near the border with Ghana, according to sources quoted by Reuters. It was not clear whether he would seek asylum. It was a defining moment for the country’s young population, many of whom were not born when Compaoré came to power in the 1987 coup in which Thomas Sankara, his former friend and one of Africa’s most revered leaders, was ousted and assassinated. Compaoré issued a statement on Friday that said: “In order to preserve the democratic gains, as well as social peace … I declare a vacancy of power with a view to allowing a transition that should finish with free and transparent elections in a maximum period of 90 days.” The announcement, read out on state television, was a sudden change from Thursday, when Compaoré vowed to hold on to power through next year, after protesters stormed parliament and other official buildings, ransacking them and setting them on fire. 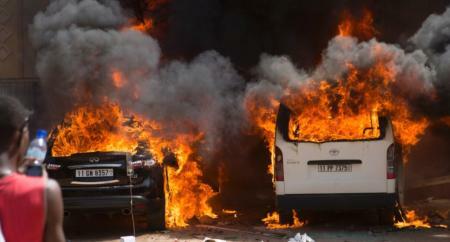 Opposition leaders said about 30 people died in Thursday’s violence. Agence France-Presse was able to confirm only four dead and six seriously injured, based partly on reports from the capital’s main hospital. For months, an opposition coalition has been urging Compaoré not to seek re-election next year, in what would have been his fifth term in power. But Compaoré and his ruling party looked likely to push a bill through parliament on Thursday that would have allowed him to run again. Protesters overran the parliament, the vote was suspended and the military announced the legislature had been dissolved and a transition government would be formed. Compaoré said he would lead the government until new elections next year. Demonstrators rejected that plan and gathered again on Friday, demanding he step down immediately. 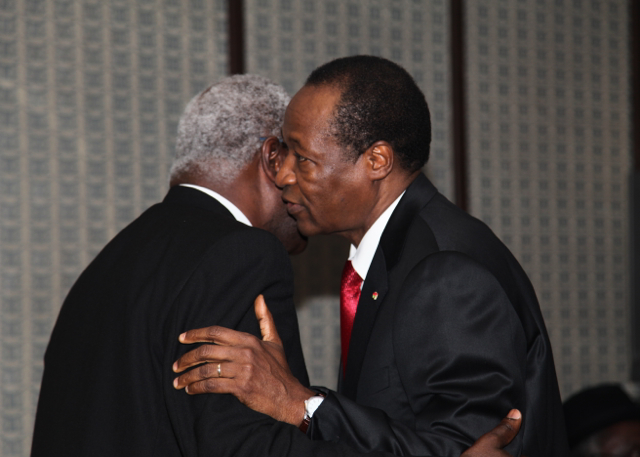 Compaoré was a close ally of the US and France but was also close to Muammar Gaddafi, the former Libyan leader, and the ex-president of Liberia, Charles Taylor, who was found guilty of aiding and abetting crimes against humanity...Burkina Faso is a landlocked country with a population of 16.9 million and ranks near the bottom of the UN’s human development index. Nearly half the population lives on less than one dollar a day." “For my part, I believe, I have fulfilled my duty, my only concern being the higher interest of the nation,” he said in a resignation statement that called for elections within 90 days. With a mix of guile, charm and impunity, Mr. Compaoré, a onetime disciple of the Libyan leader Muammar el-Qaddafi who was known as “handsome Blaise,” had built himself into a regional power broker. His influence far outweighed the strength of his nation, where more than half the youthful population has known no other leader. Events here were closely watched across West Africa and elsewhere, particularly in the handful of countries whose leaders are reported to be considering measures to extend their tenure. Some analysts said events in Burkina Faso may be taken as a warning of the perils of such action. Residents reported that a convoy carrying the president was seen leaving the capital, Ouagadougou, and heading south toward Po, near the border with Ghana. Some reports said barricades had been thrown up to stop him. It was not immediately clear how popular General Traoré's declaration of power would be, since he is was regarded as close to Mr. Compaoré. 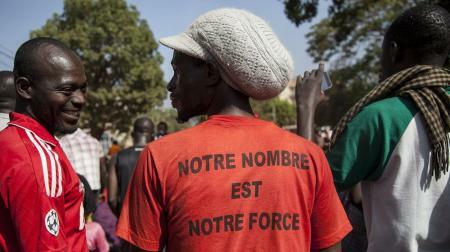 As huge crowds gathered in Ouagadougou, one army officer, who was not identified by name, signaled that the military had abandoned the president, telling the increasingly impatient protesters that the “army is henceforth at the side of the people.” The protests sprang from a legislative proposal to remove term limits from the Constitution...Mr. Compaoré's legacy is rooted in his dueling roles on the continent, both feeding conflicts in other nations and helping to resolve them. During the civil war in Sierra Leone more than a decade ago, American officials accused Mr. Compaoré of fueling the violence by funneling arms to rebels and sending mercenaries to fight alongside them against United Nations peacekeepers – in exchange for diamonds. In 2000, a United Nations panel concluded that it was “highly likely” that arms had been brought into Burkina Faso and then shipped to fighters in Angola in breach of Security Council sanctions." One Sierra Leonean political commentator Sheku Sheriff in his blog noted - "Many political watchers in Sierra Leone will be observing developments in Burkina Faso with very keen interest. Before the Ebola outbreak in Sierra Leone, there were moves being made clandestinely by country's President Ernest Bai Koroma to change the country's constitution and allow himself unlimited rule. In a bid to promote the concept, the President's minions had been on radio waves and started to already print t-shirts emblazoned with the slogan "After U nar U." Other Sierra Leoneans who were angry at moves by the President to once again introduce political instability in a country that has been through such a terrible civil war started printing counter t-shirts with the label "After Gbagbo nar U," in reference to the Ivorian leader who made an identical move and is now languishing in The Hague awaiting trial for crimes against humanity. Those printing the counter t-shirts were promptly arrested and detained for threatening public safety while those wearing t-shirts calling for the President to continue in defiance of the constitution were allowed to parade the streets of the country unchallenged. As Sierra Leoneans continue to watch the unfolding turmoil in Burkina Faso, many are wondering if a page in the future history of their country is being written." The rat and his gang could be pacing the halls of the Lodge and State House in fear of what would happen to them should Blaise campaore spill the beans about his clients in West Africa especially the regime of the rat in Freetown. Recent pictures of him and some bodyguards would seem to suggest that Burkinabes are now a part of his security detail and the kicking out of office of Blaise Campaore as he tried to foist himself upon the people would be creating huge waves of fear and apprehension, having started laying plans for an unconstitutional third term. For the first time in the history of stealing of elections, two constituencies 05 and 15 do not have the Parliamentary representatives they voted for as a compliant Parliament, a compliant National Electoral Commission and a compliant and criminal justice system saw an illegal ruling by one Showers of a judge who practically handed over the two seats to the ruling APC. Bye-elections are no longer the norm, according to Showers. Time will tell. Lest we forget kindly take another reading of what we had written about the criminal enterprise of what passes for a Judiciary and the rule of law.